Now we wanted to show you what Mummy has been working on its a Tote Bag Hand painted with Fabric Paint Not printed any way she is in the process of Painting a few more so each bag will have a slight variation due to being Painted by Hand ,when they are ready they will go on to my shop. She is working on some other stuff to but I just wanted to give you a sneaky preview! Now we feel hungry. Love the tote bag. Have a fabulous Friday. What time will SUPPER be READY? We want to be there EARLY to smell the Smells... beclaws we can tell your mum is gonna be cookering up some grand stuffs with these thingys. OMD what a super day fur showing us the Shopping Bag... that is GRRRREAt. And each one will be slightly different and quite unique. Great shopping Speedy and I'm hungry now too! Hang on a minute Speedy, I'm on my way to help you out with the cheesecake…yum,yum! What are you going to do with your shopping Speedy ? This sound really strange ! WOW....you gots Dad hungry....he would eat it all (well not your salad stuffs, Barharhar.......great tote bag there Speedy! I think that the bag is too big for Speedy to handle. What a bag! That would be purrfect for shopping! Mes sure everyone want one! 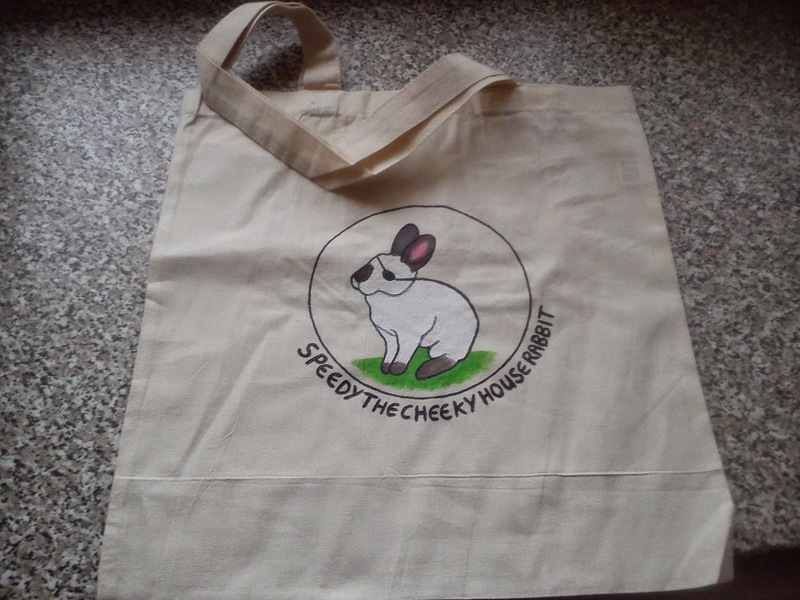 Speedy your Mum did a wonderful job on that tote bag! We like the looks of your shopping items too especially the pawsome CHEESECAKE! SPEEDY THE WORLD SHOPPER! Good morning to ya, mate! You and mummy have been on a shopping spree, and I see that you are featuring some of my favorite items...especially those Braeburn apples! OK......that bag...MUMMY IS TALENTED! She has captured your likeness to a T and they are truly wonderful. I bet mum is having a load of fun doing this, isn't she little pirate? Awww Mommy's new tote bag is so cute. Now who does that bunny remind us of???? You are adorable Speedy - in real life and in pictures. Neat how much things cost around the word. Love the bag.